Dabo Swinney had no doubt Clemson was headed in the right direction to be a national power again. He just wasn’t sure he would be around to be part of it after the 2010 regular season ended with a three-touchdown home loss to an instate rival. When Swinney got to his office with the Tigers at 6-6 after that South Carolina game, there waited the athletic director who had surprisingly named him interim coach in October 2008 before hiring him as head coach at the end of that season. But then-Clemson AD Terry Don Phillips was there to reinforce his belief in Swinney, not fire him. And Swinney soon after publicly declared that the Tigers would have their winningest decade ever by time 2020 arrived. Swinney and the No. 2 Tigers (14-0) already have, even before they play in their third national championship game in four seasons next Monday night against top-ranked Alabama (14-0). And there is still another full season to play after that, with the expectation of yet another title chance, before the calendar flips to 2020. The Tigers, who overwhelmed No. 3 Notre Dame 30-3 in their CFP semifinal game at the Cotton Bowl, have eight consecutive 10-win seasons, five ACC titles and are 95-15 overall since a loss to South Florida in the Meineke Car Care Bowl on the final day of 2010. They won the national title two years ago with a last-second touchdown against the Crimson Tide. Clemson had won 10 games only seven times in its previous 109 seasons. That included a 10-season span that started with the Tigers winning their only other national title in 1981 and ended with four consecutive 10-2 seasons from 1987-90. They were 91-22-4 over that decade. Much like Alabama, which is going for its sixth title in Saban’s 12 seasons . This is the fourth season in a row the Tigers and Crimson Tide will play in the College Football Playoff. Alabama won the 2015 national title, Clemson won the rematch in 2016 and they played in a semifinal last year that the Tide won on another championship. Swinney played at Alabama, began his coaching career as a graduate assistant at his alma mater for three years, then had five seasons (1996-2000) as an assistant coaching tight ends and receivers there before a head coaching change. After a few years away from football, Swinney became Clemson’s receivers coach in 2003, the same job he still had when Phillips replaced the fired Tommy Bowden with the assistant who had never been a head coach — or even a coordinator. When Saban was just getting started at Alabama after the 2006 season, he offered Swinney a spot on his staff. Bowden added the title of associate head coach to get Swinney to stay. 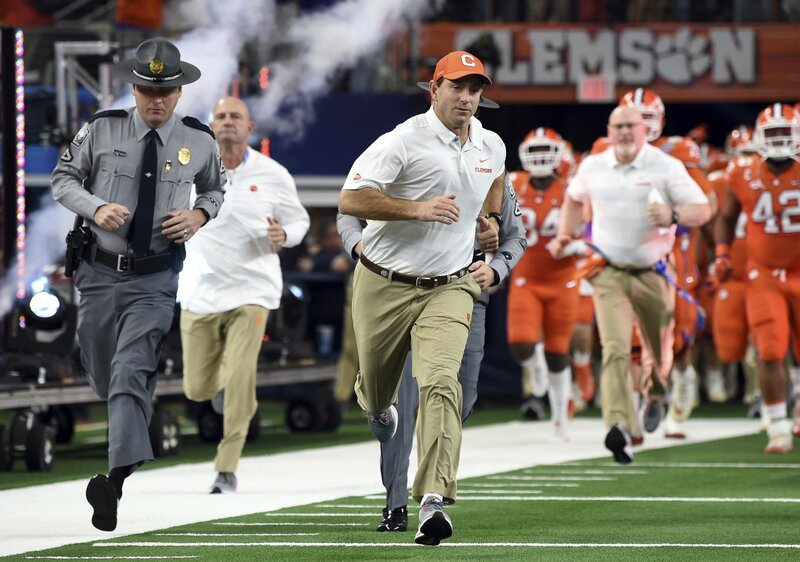 Clemson went 4-2 to finish the 2008 regular season before Swinney had the interim tag removed that Dec. 1, exactly 10 years before the Tigers won their fourth consecutive ACC championship game last month. The Tigers won the ACC Atlantic Division in 2009, his first full season. But the external pressure was on Swinney and Phillips in 2010 even though five of the losses, including their bowl game, were by less than a touchdown. Swinney still vividly remembers that conversation with Phillips, who retired in 2012, a year after the Tigers won their first ACC title in 20 years. There are certainly no doubts now about the folksy 49-year-old coach.